Mexican lobby card for "Tres Hijos del Diablo" (U.S. title: "3 Godfathers), 1948. Standard Mexican lobby card size, 12½x16½ inches. We really don't know why the Mexican release was titled "Three Sons of the Devil," considering it's really a Christmas movie. It's about three bad guys finding redemption when, at great personal sacrifice and even in death, they place the life of a babe in swaddling clothes above their own. ("Three godfathers" in Spanish is "tres padrinos.") 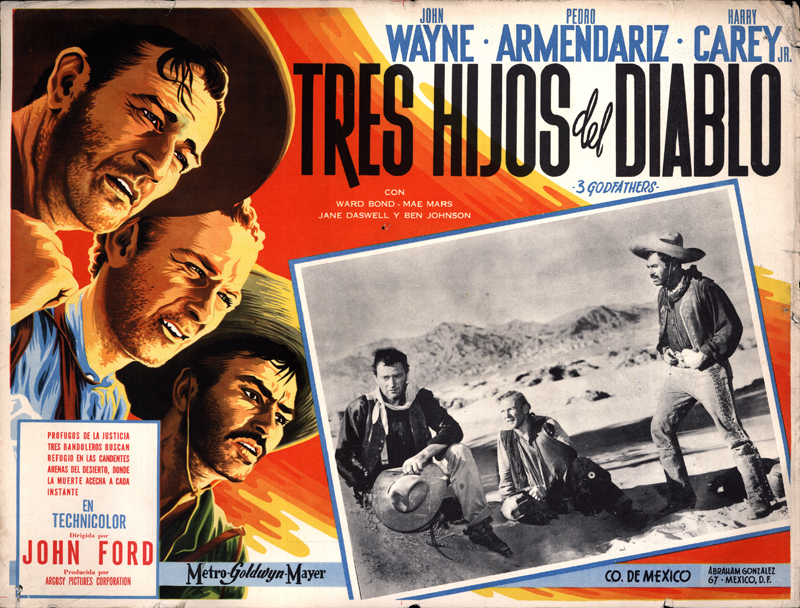 The tagline on this lobby card doesn't give justice to the plot: "Profugos de la justicia tres bandoleros buscan refugio en las candentes arenas del desierto, donde la muerte acecha a cada instante" (Fugitives from justice, three bandits seek refuge in the burning sands of the desert, where death lurks at every moment). Filmed on location in Death Valley, the Owens Valley (including the Alambama Hills) and at the RKO ranch in Encino, "3 Godfathers" (Argosy Pictures/MGM 1948) was directed by John Ford and stars John Wayne, Pedro Armendariz and the SCV's own Harry Carey Jr. It was released Dec. 1, 1948, in the United States (a Christmas release), and we don't know the exact release date in Mexico. About Harry Carey Jr. in "3 Godfathers"
"3 Godfathers" was the first of nine films Saugus native Harry Carey Jr. (aka Dobe) would make with director John Ford. Dobe's dad, Harry Carey Sr., had starred in 26 John Ford Westerns. Senior died in September 1947; "3 Godfathers" started shooting in late May 1948, and Ford would dedicate the film "To the memory of Harry Carey / Bright star of the Western sky." Dobe devotes an entire chapter to "3 Godfathers" in his 1994 autobiography, "Company of Heroes: My Life as an Actor in the John Ford Stock Company," and you really have to read it to get a complete picture of the interplay among Ford (whom Dobe calls "Uncle Jack") and the leading actors — 41-year-old John Wayne; Mexican film star Pedro Armendariz, 36; and Dobe, 27. Principal location filming was done in Death Valley. Cast and crew lodged at the Furnace Creek Inn. Studio filming was done at RKO Pathé Studios on Washington Boulevard in Culver City. Dobe had sung once before on camera — part of a cowboy song in the Howard Hawks film he's just completed, "Red River" (1948). Now, Ford wanted him to sing "Streets of Laredo" to the ersatz Christ child. That was the plot: Three outlaws come across a dying woman in the desert and vow to save her baby, and in the process they redeem themselves. Burl Ives had taught Dobe the first and last verses of "Streets of Laredo" in 1940. Dobe sings it softly as a lullaby to the "baby," which he describes as a "pretty worn-out" doll. "It was hard to keep believing this doll was really alive," Dobe writes, "and it was doubly hard to keep the top of its head from being exposed to the camera." Dobe's death scene was shot at the Devil's Golf Course — not an actual golf course but a large salt pan on the floor of Death Valley, more than 270 feet below sea level and 126 degrees under Ford's beach umbrella. Dobe delivered what he thought was a fantastic performance. Ford wasn't happy. Ford, who never liked to do more than one take, demanded a retake — but not before he made Dobe lie in the sun and think about it for a while. ...everybody walked away, way back to where the location trucks were parked. I lay there, squinting up at the bright sky. My mouth got so dry I couldn't swallow. My back was on fire. That salt flat was so hot I felt I was in a frying pan. I was there about 30 minutes, and by then, I didn't care if I did die, but I still wanted to be very good for him! There we were, just me and the camera. It looked lonesome. They must have unloaded it. At 130 degrees, the film would melt into a glob. Finally — finally, here they came back ... [Quoting Ford:] "Okay, okay, let's get this thing over with." He leaned over me. "How do you feel now, huh? How do you feel now, kid? Are you going to play the goddamn scene, or are you going to chicken out on me? Maybe it would be better just to say, the hell with it, and send you home, eh?" He kicked me on the hip with the side of his foot, just to get my attention. He yelled out, "Quiet on the set! This will be picture!" He was enjoying himself. "Everybody ready? We are rolling!" The voice of the soundman, "Speed." At last. It wasn't me talking. I heard a voice I'd never heard before, the voice of a dying young man. Who was this? It was like I was outside myself. The broken sentences went on, one after the other, until the last, "God bless Momma and Poppa, and make me a good boy. Amen." It was over. Duke [Wayne] lifted me to my feet. He had his arms around me, holding me up. Ford took my face in his hands. He was smiling. "Why didn't you do that the first time? See how easy it was? You done Good! That's a wrap!" I wandered around, delirious, until Pete [Armendariz] pointed me to the station wagon. I knew I had passed the test. From now on, it would be different. 1. SCVTV "Newsmaker of the Week" interview with Harry Carey Jr., Nov. 3, 2005. LW2699: 19200 dpi jpeg from original lobby card purchased 2014 by Leon Worden.